Present book is written with a basic conviction that Acharya Mahapragya is a Super Intelligent human whose discourses and writings are based on the knowledge imparted by Lord Mahavira who was a Super Human Intelligence. 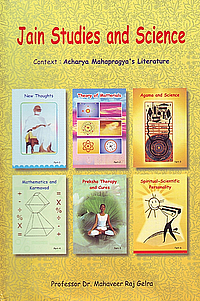 Acharys Mahapregya is a living encyclopaedia of Jain teachings. In addition, he holds command on Ancient Indian Philosophy, Modern Psychology and contemporary Scientific Principles. He has incessantly inculcated science into his literature to make itcomprehensible to even those who examine the religion critically. He feels that the rapid strides made by science are irretrievable and it is impossible to reverse this trend. The ills and perils of this hectic groth have now become a full blown predicament and science needs to be amalgamated with the religious thoughts to get rid of its evils. Religion yearns for an eternal soul ans science for an undying body, so why not have the best of both - let us endeavour to attain a perpetual soul in conscious mind and healthy body!